A refreshing appetizer is always a delightful way to begin a summer meal. 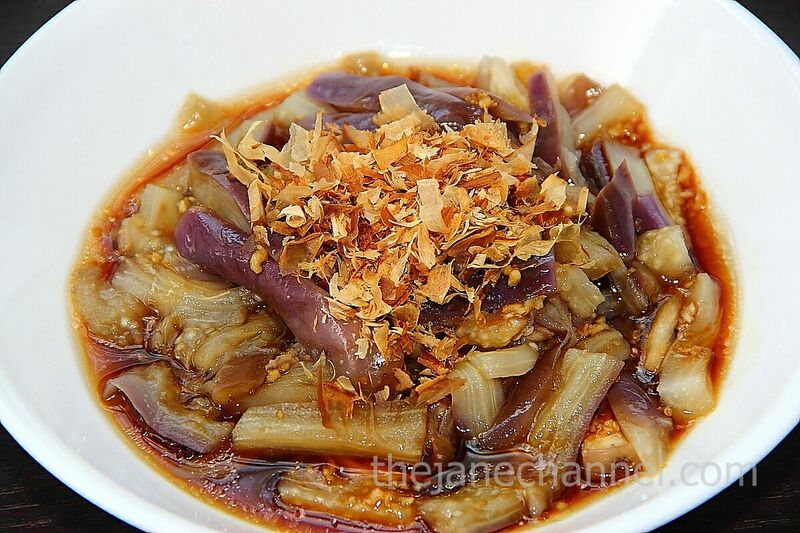 Eggplant is quite tricky to cook well, however, as it readily absorbs a lot of oil. Here, we first steam and chill the eggplants, before applying the sauce in the end to avoid the dish being soaked in oil. Some people find eggplant is bitter. You can remove the bitterness by salting: first cut the eggplant in thin strips, soak them in salt water for 20 to 30 minutes. Rinse, and squeeze out the water then proceed with your recipe. *Please note that some soba sauce comes in concentrated form and needs to mixed with water. Be sure to refer to instructions on the bottle. Slice eggplant into thin slices and place on a plate. Place plate in a steamer, cover with lid and steam for 15 minutes. Remove the plate from the steamer and let it cool down for 30 minutes and refrigerated for an hour. Combine soba sauce with garlic in a small bowl. Pour it on top of the eggplant. Drizzle some sesame oil and bonito flakes on top. Glad to see you still have a beautiful bright purple color after steaming. I love the addition of bonito flakes on the top. Thanks 🙂 I’m glad you like it.